Membership in the Daughters of the American Revolution, DAR, honors and preserves the legacy of your patriot ancestor. Over two hundred years ago, American patriots fought and sacrificed for the freedoms we enjoy today. As a member of DAR, through participation in the Society’s various programs and activities, you can continue this legacy by actively supporting historic preservation, promotion of education, and patriotic endeavors. To be eligible, you must be 18 years or older and be a direct descendant of an ancestor who aided in the cause for American independence between the Battle of Lexington, April 19, 1775, and the withdrawal of British troops from New York on November 26, 1783. If someone in your family was or is a member of DAR, you may apply in connection with that family member. We hold six genealogy workshops per year to assist you with your application. For meeting and workshop information please contact us. We can help you get started with your application. In order to prepare your application for membership, Knickerbocker Chapter, NSDAR, members will help you research your family history and collect relationship documentation. 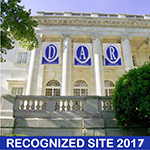 The DAR Genealogical Research System is available from the National Society Daughters of the American Revolution for the purposes of general research and assisting with the DAR membership process. You can get started with worksheets and tips on the DAR website.